With the new year comes the thought I should consider posting here more often. I haven’t had that much occasion to be on the ‘road’ lately though so not as many interesting things – at least from my point of view – to post about. 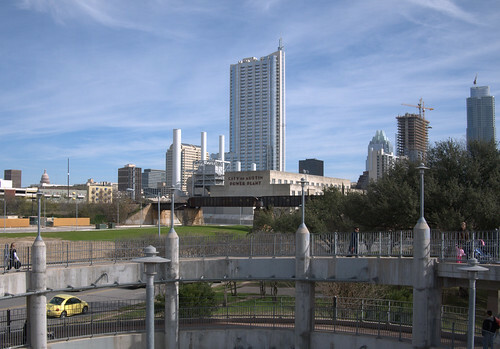 But it occurs to me that with my office move to downtown Austin, perhaps I could post a few notes about my downtown ramblings. One of the nice thing about the move to downtown has been the opportunity to take longer walks at lunch. While the old office location was near the Barton Creek greenbelt and a good place to hike, I couldn’t grab lunch along the way like I can now. Consequently I’m taking to the streets more when I can find the time. And lately, toting the camera along too. So I took this photo looking back onto downtown from the pedestrian and bicycle bridge over Town Lake. This is about a block or so from the office. There’s otherwise no good way to walk or bike over Town Lake in this section of town so the pedestrian bridge is a real blessing. Walking the regular Lamar street bridge where the cars/trucks are is practically a suicide mission. I’ve walked it and you realize once you get out there on the narrow bridge sidewalk that you’ve got cars whizzing by 1 foot to your left and a long drop to the river 1 foot on your right. Yikes. Anyway, in the picture you’ll see the old art deco Seaholm power plant right smack in the middle (retired). Behind it is the 44 story 360 tower. Far off to the right is the incomplete Austonian. I’m not sure what the other one with the crane is. These are only a couple of many high rise condos that have sprung up in recent years. You’d never know there was a recession going on judging by the number of cranes and buildings still going up. Then again, many of these got started before things began to tank. Anyway, the choices are many and varied as I wander among the downtown hipsters so my personal ‘blog project in the near term is to occasionally try to take note of it.